I’m getting straight to business today folks because I have been totally addicted to these lately and I’ve been dying to share. Seaweed may not be the first thing that comes to mind when you think “crunchy salty snack food” but trust me after a few bites of these, it will be. Inspired by this recipe by foodie god Mark Bittman. Hot tip: buy your Nori sheets from an Asian market rather than the grocery store. They usually sell them in much larger quantities for a fraction of the price. Torontonians should check out P.A.T. Central or Sanko. 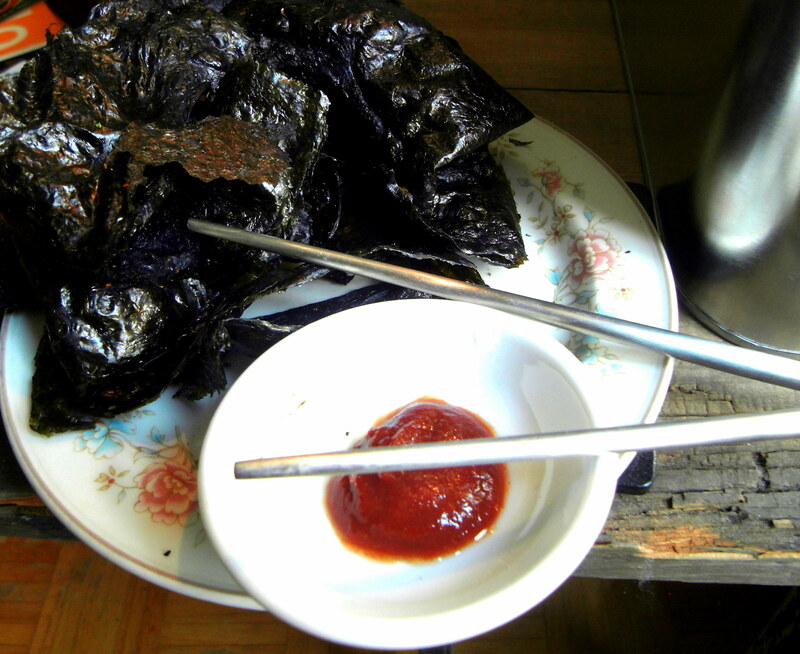 Fold Nori in half so you create a strong crease, then unfold. Using a kitchen brush, paint half the inside of the Nori sheet with a little water using your pastry brush. Sprinkle sea salt & toasted sesame seeds over the moistened side then fold and stick the Nori back over top. Slice the Nori into 5 pieces. Continue with the remainder of the Nori sheets then transfer finished pieces onto a foil or parchment paper lined baking sheet. Very lightly brush some extra water on top of the chips before placing into oven. Bake at 250 degrees for 10-15 minutes or until crunchy. Eat em up plain, dipped in a little siracha or crunched up and sprinkled on salads n’ stuff! NOM. Variations: Try mixing a lil vinegar into the water for a salt & vinegar chip flavour. Or add a little onion powder and nutritional yeast for a sour cream n’ onion style snack.